Hos Dorte: Branch Out, a DT card for HM&FMC. Branch Out, a DT card for HM&FMC. Hi and welcome to a new challenge at House Mouse &Friends. Show us any kind of branch on your image. 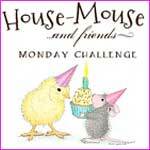 use a House-Mouse Designs(R) House-Mouse Friends /Happy Hoppers, or, Gruffies image stamped/decoupage or CD rom. I love the green checkered ribbon, it's mounted with a golden brad. I've added some sparkle on to the pine needles. Hi Dorte, I like the mice stamped and colored on kraft paper. Makes such a cute Christmas card. One more for the pile, right! Beautiful card Dorte. Love that image. Fabby looking card, stunning with the colouring on craft card. Love it. Thanks for joining us over at the Winter Wonderland this time around. Such a pretty festive card. Thanks for joining in with The Ribbon Girl October card challenge and good luck in the prize draw. Cute card! thanks for joining us at the sketchy challenges! Very cute card. Lovely image and design. Nice touch of using the rhinestones. Perfect for the "sparkle" challenge at Pile it On. TFS and good luck. Christmas, A DT card for HM&FMC! 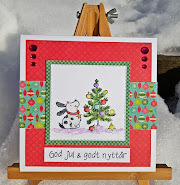 Vertical, a DT card for ABC Christmas Challenge. 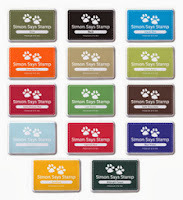 Get in shape, a DT card for HM&FMC. Shape it Up! A DT card for HM&FMC.